Leave your cares and worries behind when you step into a treatment at The Cedar Tree. Immerse yourself into a luxurious experience that is all about you. With each therapy our intention is for your mind to be relaxed, your body energised and your spirit refreshed. Therefore bringing about balance.To enjoy the feeling of complete nourishment and gain maximum benefit it is recommended that you take extra time to sit quietly at the end of your therapy and enjoy a complimentary tea, allowing the experience to really resonate for you to feel a sense of calm, peace and vitality. All initial therapies will include a consultation and some will incorporate both a tongue and pulse diagnosis, which will help to indicate your current state of balance. This allows us to ascertain which oils, herbs, healing and therapies are best suited to you. Truly unique experiences that are exclusive to The Cedar Tree. This 90 minute treatment, rooted in ancient Ayurvedic wisdom begins with a relaxing head massage, then a specially selected herbal warm oil is used with sweeping strokes to revitalise and detoxify the body. The marma points ( energy centres) of the hands and feet are then massaged. The therapy finishes with energy healing.This treatment will leave your body energised your mind relaxed and your spirit refreshed. Wonderful for releasing physical and emotional blocks. Our reflexology treatment commences with a seated head, face and neck massage, followed by reflexology of the feet. Reflexology stimulates the body’s own healing process and aims to restore, rejuvenate and bring about balance. This therapy is enhanced with the use of essential oils which are blended and tailored to your specific requirements. This healing facial steeped in eastern tradition uses specially selected oils, energy points and massage strokes to bring harmony and balance to your mind body and spirit. This facial therapy moves beautifully to enhance energy in the shoulders, neck, head and face. Then flows to to your hands and feet. Lie back and enjoy this luxurious treatments which will leave you feeling relaxed and at peace. With every journey you can only truly make a start from where you are, this therapy is unique to you and your needs. Through a choice of Massage, Crystals, Sound healing, Pranic healing, Reiki, Celtic readings, Essential Oils and Herbs, connect to your true self and begin a healing process that continues to resonate after your therapy. This therapy begins with relaxation techniques and mediation flowing into a yoga sequence that is specifically designed for you and concludes with a therapy of your choice.This signature therapy is enhanced by the use of essential oils, sound healing and breathing techniques. A perfect mind, body spirit experience. 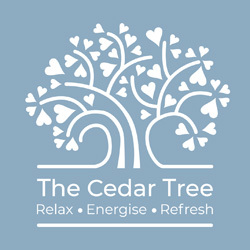 Essential oils are a significant part of The Cedar Tree experience, each have their own unique therapeutic properties which can be blended and tailored to your specific needs. Originating in India more than 5000 years ago, Ayurveda is a natural approach to achieving and maintaining health in the mind, body and spirit. In this relaxing massage warm oil is used with sweeping strokes to revitalise and detoxify the body. A deeply relaxing therapy that stimulates your physical and emotional healing process. Your feet and/or hands are massaged and throughout the treatment pressure is applied to energy points which relate to specific areas of your body. Reflexology aims to reconnect you with yourself and bring about balance, leaving you feeling relaxed and refreshed. Offers a fusion of therapeutic techniques combining a wonderfully relaxing and stimulating massage and acupressure to the face, head, neck and shoulders. An amazing holistic experience that is hailed as a natural non surgical facelift aims to leave you glowing on the inside and out. An intensely relaxing and revitalising seated massage, encompassing a variety of techniques to the neck, shoulders, face and head. It aims are to improve circulation and lymph flow in the head region and help remove physical and emotional energy blockages. It also stimulates the sensory organs and relaxes the mind and soul. A beautiful, ancient healing therapy that utilises the natural power of crystals and gemstones to improve health and wellbeing. Specially chosen crystals are placed around the body to promote and support natural self- healing. Crystal pendulums, crystals, sound, colour and essential oils are used in this therapy to help balance your chakras. Complementary and Healing therapies are about treating the whole person and not just the symptoms it is only by trying a complementary therapy and healing system that can we truly judge its worth.